Floor Kids is a new breakdance battle game featuring unique freestyle gameplay, rhythm challenges, and multiplayer sessions. Discover stylized hand-drawn graphics by award-winning animator JonJon set to an original soundtrack by world-renowned scratch DJ/producer Kid Koala. Innovative controls allow you the freedom to play the way you like with a dynamic scoring system that rewards your moves based on musicality, originality, and style. Build up your crew of bboys and bgirls, unlocking new characters and locations as you cross the city, busting hundreds of different moves and countless combinations on your journey from the corner to the club. Bring Your Skills. Build Your Crew. Find Your Style. MERJ was founded in 2015 by veterans of game development, animation, music production, and live performance. By merging the resources of four creative studios – JonJon Animation, Kid Koala Productions, Envision Management & Production, and Hololabs – MERJ harnesses their expertise to build innovative experiences combining scratch, sketch, script, and screen. Mike Wozniewski of Hololabs (the 'M' in MERJ) is a 15-year veteran of interactive software development. He comes from a background in academia, working as a researcher at the Centre for Intelligent Machines at McGill University, then at the Volumetric Audio Lab at Université de Montréal, the Society for Arts & Technology, and the Technoculture, Art and Games (TAG) centre at Concordia University. His research focuses on creation tools for real-time interactive systems, human-computer interaction, motion tracking, virtual reality, and immersive environments. Mike has more than 20 peer-reviewed publications appearing in various international conferences proceedings, journals, and books. As president and CTO of Hololabs, he leads research & development teams in creating games, mobile applications, and virtual reality experiences. As the VP of Technology at MERJ, he provides design and concept work for new interactive media experiences, and serves as technical director to help these projects become reality. Eric San, a.k.a Kid Koala is a world­renowned scratch DJ, music producer, and award winning graphic novelist. He has released four solo albums on Ninja Tune: Carpal Tunnel Syndrome (2000), Some of My Best Friends Are DJs (2003), Your Mom’s Favorite DJ (2006) and 12 bit Blues (2012). He has also released two graphic novels: Nufonia Must Fall (2003) and Space Cadet (2011). He has also been involved in collaborations such as Gorillaz, Deltron 3030, and The Slew. Kid Koala has toured with the likes of Radiohead, the Beastie Boys, Money Mark, A Tribe Called Quest, Mike Patton, DJ Shadow, and The Preservation Hall Jazz Band and performed on Late Night with David Letterman. He has contributed to scores for the films ​Shaun of the Dead​, ​Scott Pilgrim vs. The World​, Looper​, ​The Great Gatsby and ​Men Women and Children​. He has composed music for The National Film Board of Canada, the Cartoon Network, Sesame Street, and Adult Swim. He has also been commissioned to create music for runway shows for Belgian fashion designer Dries Van Noten. Kid Koala’s unforgettable live shows range from silly touring turntable carnivals like Short Attention Span Theater (featuring turntable bingo) and Vinyl Vaudeville (including puppets and dancers) to quiet­time events like Music To Draw To and his Space Cadet Headphone Experience, each which express his unique form of storytelling with music, animation, film, and interactive entertainment. He has toured to 6 continents. Ryhna Thompson has been the Founder and President of many businesses in the cultural and creative industries. Under the banner of her company Envision Management & Production, now celebrating 15 years, she develops, manages and produces boundary-breaking musical and multi-disciplinary artists, productions and organizations. She has worked with cutting edge, internationally recognized artists such as Kid Koala, Amon Tobin, Bell Orchestre, Esmerine, FOXTROTT, Colin Stetson, Tim Hecker and many others. Ryhna works with artists to conceive, produce and manage projects in the realm where music intersects with film, animation, theatre, literature and interactivity, and in the context of building long-term careers. She helps artists to define their goals, to create an infrastructure within which an authentic artistic vision can be nurtured, realized and protected, to build and direct teams, and to ensure that they are stakeholders in their success. Recent projects include Kid Koala’s Nufonia Must Fall, a graphic novel presented as a feature length film, performed in real-time, on-stage by a team of 12 puppeteers, musicians and crew, accompanied by a live soundtrack. Now in its 4th year of touring, it has been presented on 5 continents. Ryhna serves as Senior Producer on Floor Kids™ which is out now on Nintendo Switch™. She is President of MERJ Media. Jonathan Ng, a.k.a. JonJon is an award winning, multi-disciplinary animation filmmaker whose unique set of hand-made styles focus on merging themes of action, experience and fantasy. His last film Requiem for Romance, a water ink slice of life, has toured festivals around the world, winning Best Art Direction at Anima Mundi in Brazil before being badged by Vimeo Staff Picks and being presented to the major studios in California as part of the Animation Show of Shows. Having worked in the animation industry since 2004, his feature animation credits include The Little Prince, April and the Extraordinary World, and The Day of the Crows. Jonathan is best known for one of his earliest films, Asthma Tech, produced at the National Film Board of Canada, a semi-autobiographical tale which was rendered in his original style of youthful flare. His work continued to evolve into Floor Kids which started out as a series of short animated b-boy battles in co-creation with Kid Koala. 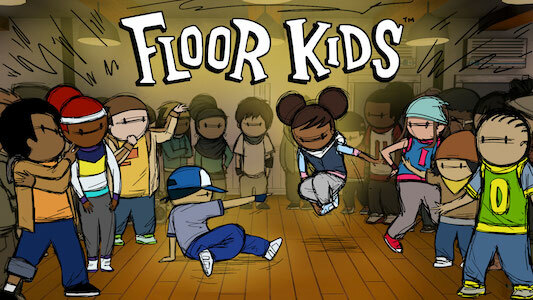 Floor Kids is now being produced as a video game by MERJ. As VP Creative of the company, JonJon drives the art, visual design, storytelling, animation, choreographic graphics, and guiding the art pipeline. © Copyright 2017 MERJ Media, a division of 9420860 Canada Inc. All rights reserved.